It’s always a difficult time when you realize your floors have become worn out too worn out to continue using. While for minor damage or surface damage, a good refinishing job will help you however, how do you know the difference between a floor that simply needs a new layer of finish and a floor that has to be completely replaced from the ground up? Our guide can help you in this situation. So what are some signs that it’s time to replace the floor? The act of sanding and retouching the boards has left them themselves in a state of disrepair. They’ve gotten to the point where they’re too fragile to be sanded again unfortunately leaving you no choice but to begin looking and hunting for a new floor. You can tend to identify the damage by grooves within the boards. If the boards shift or creak during movement and shift greatly in between the individual planks, then replacement is not a terrible choice for you as a finish will not be able to undo the general lack of balance the boards have. If insects have done general and great damage to the floor it could be time to replace it. When the damage is done to more than just the surface but the boards themselves, that’s a good area to look at. In short, if the floor itself is seeming fragile, if the boards themselves and not the tops of them feel chipped and as if they’re about to collapse, then simply a refurbishing will not do. 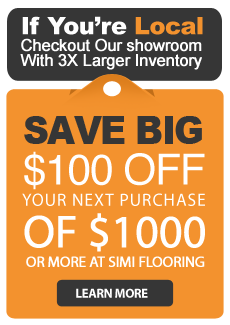 Replacing the floors would be the ultimate goal and luckily Simi Flooring will have you covered. For your next floor, consider the different types of woods you can get to try to avoid the problems of the old one that caused you to get it replaced. For example, if its the consistent wear and tear of a household that has many kids and pets you should consider a floor with a sturdier structure for your next one. In short, look at this as an opportunity above anything else. It is an opportunity to get an incredible floor.